Ecometrica has won the prestigious US Environmental Leader Product of the Year Award for the third consecutive year for the Ecometrica Platform, which helps business, governments and society to understand and monitor environmental impacts, and protect the planet’s resources for existing and future generations. The Environmental Leader judges described Ecometrica Platform as a “proven software package with impressive business applications and results”. They added: “Ecometrica’s system is certainly world class in this respect. It combines multiple technologies into a single platform. It’s scalable. And clearly, significant results have been realized by the clients who have utilized this software”. Used around the world by large corporates and governments, the Ecometrica Platform combines geospatial data from Earth Observation satellites with information gathered on the ground to create detailed maps, which track changes to forest ecosystems, crops and even soil moisture. The company has won landmark contracts with NASA and the UK Space Agency’s International Partnership Programme (IPP), which sees Ecometrica spearhead the ‘Forests 2020’ project. The judges noted that the benefits companies obtain from the software’s audit-ready outputs, and Ecometrica’s status as a CDP Gold Software Partner, deliver additional value to its customers in terms of both time and money required to prepare for external verification activities. “The comprehensive nature of the reporting system, along with accreditation by numerous agencies, makes it substantially ‘value added’ compared with others in its class,” the judges said. ”Strong data and analytics provides a key foundational element of driving successful energy and environmental management programs”. Gary Davis, chief executive of Ecometrica, said: “It is an honour to win the Environmental Leader Product of the Year for a third year in a row. It’s a testament to the quality of the Ecometrica Platform, which is redefining and setting the global standard for geospatial sustainability reporting and also to the ability of our talented team to constantly innovate and evolve in response to technological advancements”. Ecometrica was unveiled as winner of the coveted gong at Environmental Leader’s conference in Denver on May 16th. It is the latest in a long list of accolades for the Edinburgh-headquartered firm, which in 2018 alone has been named on the FT 1000 list of Europe’s Fastest Growing Companies; Inc.’s 5000 Europe ranking of the fastest-growing privately held companies in Europe, the GP Bullhound Northern Tech Awards, which recognises the fastest growing exceptional technology companies in the North of England and Scotland. 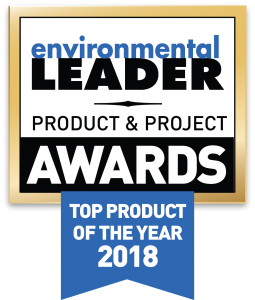 In its sixth year, the Environmental Leader Product & Project Awards recognize excellence in products and services that provide companies with energy and environmental benefits, or in corporate projects that improved environmental, sustainability or energy management and increased the bottom line. It is a five-point rating system designed to offer companies feedback and recognition. Third-party judges came from the following companies: Advanced Micro Devices, ATT, Best Buy, CandA, Caesars, Cox Enterprises, Fetzer Vineyards, General Motors, Harbec, Kellogg, LNS Research, Marriott, MillerCoors, Newell Brands, Novartis, Oldcastle Inc., Panasonic, Parker Hannifin, Paul Leavoy/Consultant, Safeway, Sears Holdings Corporation, Sierra Nevada Brewing Company, Strategic Sustainable Consulting, Tyco Global Products, Wellborn Cabinet, and Zee Company/Member of the Vincit Group.